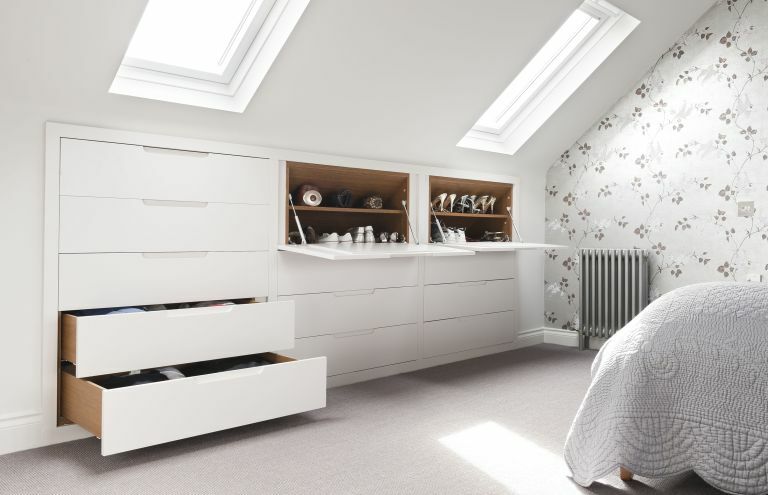 While a loft conversion can add as much as 50 per cent more space to your home, and increase the value by up to 21 per cent, practical use of the space is what makes the difference between a great room and a glorified storage area. Adding a bedroom can be one of the most profitable uses, or you might want to turn it into a home office, but sloping ceilings and awkward nooks can make it hard to find furniture to fit. Use this guide to find the best loft and attic storage ideas. Then use our essential guide to loft conversions to find out how to plan yours. Check out our storage hub page for more neat storage ideas and buys. Adding a bedroom is a popular way to use your loft conversion. However, finding chests of drawers or wardrobes to fit the space can be very hard as the slope of the roof limits the available floorspace for large furniture. The location of the stairs, might also be a limiting factor meaning space may feel wasted. This is where custom built furniture becomes your best friend, although it's not the only option. Browse these clever loft bedroom and bathroom storage ideas, then check out our bedroom storage ideas for more inspiration and advice. We have ideas for small bedroom storage, too. Where space is at a premium, built-in storage can be the best way to utilise every single centimetre. This bedroom in a converted chapel used as a holiday home in County Durham, includes a wall of storage that is fitted around the bed and follows the angle of the roof. It offers a place to display a few treasured items, and hanging space for guests' clothing. Old homes take much of their character from their imperfections, such as wonky walls and floors. While this adds to their charm, it can make finding furniture to fit a nightmare. Choosing a custom-made shelving unit has made it possible to include floor-to-ceiling storage in the loft bedroom of this converted mill. The 15th-century building does not lend itself to anything off-the-peg and choosing a freestanding shelf prevents any issues with the slight movement of the building and allows for ventilation. Bedroom storage needs fit various types of object so choosing a mixture of wardrobes and drawers for clothes, plus shelves for miscellaneous items and ornaments is the way to go. Shown here in the Dove Grey gloss, Parity Style 3 is available in six widths and one height, allowing customisation for any space without imposing on the room. Kindred retail prices start from around £2,500, for a small bedroom, available nationwide from independent Kindred specialist retailers. Don't miss a trick when finishing your loft room by missing the chance to include some storage space in the eaves. This could be as simple as creating an enclosed space with an access hatch to hide away Christmas decorations, suitcases and old toys. Or, you could be a bit more creative and build a recessed shelf like this one in a room set by Valspar (featuring walls painted in Whisper Softly 3). Positioned right next to the bed, it can be used in place of a bedside table – a great option for a small space. If you think a sloping ceiling will mean some space will be left redundant, think again. This ingenious storage solution from Barbara Genda creates a angular storage solution for an angular item – your high heels! These cupboards with drop-down doors were made for the homeowner's shoes meaning not a single inch of potential storage space has been wasted. Made-to-measure drawers complete the design, creating a place to fold away tops and socks. If you're looking for clever bathroom storage ideas for your loft bathroom, the key is to use (once again) the eaves space that will go otherwise unused. Creating storage pockets like this will make the bathroom feel less boxy, bigger, more characterful and it takes up no storage space. Thumbs up from us. For more bathroom storage ideas, see our guide. You may choose to turn your loft into a dressing room or master suite (don't miss our design ideas) including good looking clothes storage, even a walk-in wardrobe. For long, hanging items, you will want to try and make best use of vertical space, but don't neglect low-level storage for shoes, bags and folded items. Use our guide to find out how to create a dressing room, and check out our walk-in wardrobe and dressing room design ideas for more inspiration. Open clothes storage – in other words, an on show dressing room – really only works if you keep your clothes super neat. However, the upsides are that everything is easily to hand. Our advice? Swap open clothes panels for ones with mirrored doors to double the space, up the light levels and hide the clutter. If the cost and permanence of a fitted storage solution does not appeal, go for a modular array that you can build yourself. This bracket, shelf, rail and drawer combo from Elfa is fitted to a set of wall-mounted runners and makes great use of the space in this loft dressing area. Modular storage like this can be adapted and added to as needs change. See that grill on the wall? That is Elfa's version of the classic pegboard which can be used for storing your jewellery and accessories. Even if you aren't a shoe-addict, needing a good pair of trainers for sports, smart shoes for work, a pair for special occasions and some sturdy boots for a good walk means that shoe collection can soon grow. So, adequate shoe storage is a must. Not only do you need ample space for every pair, but being able to see them all helps you to make use of them, rather than leaving them languishing at the back of the cupboard. This dressing room design by Barbara Genda has the advantage of higher eaves, allowing for full-height shelves for plenty of pairs or heels, sneakers and boots, and wardrobes for clothes too. Placing your home office in the loft can be a good way to achieve some degree of separation from the rest of the house. Again, full walls of built-in storage is the best way to make room for everything your office needs. A desk for your computer and a good chair are the obvious purchases when kitting out your office, but don't forget you need a place for all the paperwork, printers, stationery and other work-related bits and bobs. This storage solution from Neville Johnson not only provides hidden storage for files and pens, but also gives the homeowner somewhere to place decorative items than prevent the space from feeling too utilitarian. The space beneath Velux windows is often wasted within a loft extension. Building shallow shelving that's just deep enough for files will give you a practical loft storage idea that will look neat and uncluttered, too. A converted loft can be the perfect space for a playroom or kid's bedroom as they do not need usually need the full-height storage that an adult might. Instead, under eaves cupboards or toy boxes and bins can be used. If you do have any wall space, open shelves or hooks can be a great way to add a bit of extra storage. Find more playroom design ideas in our guide. Where the height of the room can't be used, make the most of the room's footprint with storage benches, boxes and trunks. This kid's room by Barbara Genda has discreet cupboards on one wall, then utilises an awkward dormer space with a window seat containing drawers. A handy space to hide toys, and a comfy seat for friends! When the height of a room can be used, take advantage by using the tallest wall for floor-to-ceiling storage. Build desk spaces into it for versatility, like in this room by Paul Archer Design.